Bowling Green, KY – October 13, 2010 - The American Planning Association (APA) today announced the designation of Fountain Square in downtown Bowling Green as one of 10 Great Public Spaces for 2010 under the organization’s Great Places in America program. APA Great Places exemplify exceptional character and highlight the role planners and planning play in creating communities of lasting value. APA singled out Fountain Square for how it engenders a strong sense of place – not only for its historical significance but also for its role in fostering civic engagement and community pride for more than 100 years. Through Great Places in America, APA recognizes unique and authentic characteristics found in three essential components of all communities – streets, neighborhoods, and public spaces. APA Great Places offer better choices for where and how people work and live every day and are defined by many things including planning efforts, architectural styles, accessibility, and community involvement. Since APA began Great Places in America in 2007, 40 Neighborhoods, 40 Streets and 30 Public Spaces have been designated in 47 states and the District of Columbia. “We’re very excited to name Fountain Square as one of this year’s Great Public Spaces,” said APA Chief Executive Officer Paul Farmer, FAICP. “The Square represents the physical, commercial and social center of Bowling Green, and has been that way for more than a century. City officials recognize the Square’s role in helping foster community pride and ownership,” he added. Located at the heart of the downtown business district, the Square is fronted by commercial, residential, governmental and institutional buildings with original facades dating from the late 19th and early 20th centuries. The park’s scenic and historic attributes attract foot traffic to the area, giving nearby merchants a steady supply of shoppers and customers. 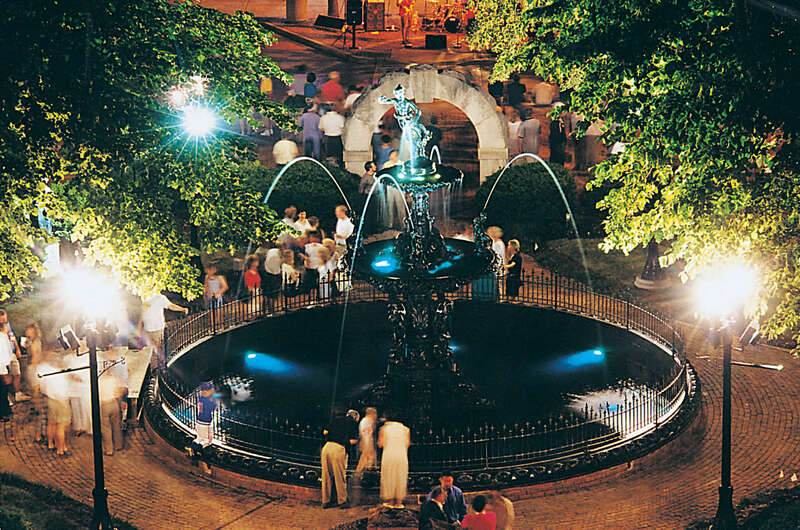 Additionally, the square hosts several annual events and festivals drawing thousands of visitors each year. The park’s history dates to 1870 when Bowling Green’s second mayor, John Cox Underwood, drew up plans for the site. Originally occupied by a courthouse, the two-acre plot was transformed into an outdoor living room for the community after the structure was moved a block away. Today the landscape of Fountain Square remains largely unchanged from R.L Sturtevant’s original design. The park features luscious greenery with its namesake ornamental black-iron fountain, dating from 1881, in the center. Two identical limestone arches frame the fountain at the park’s entrances on Park Row and Main Avenue. The Bowling Green Downtown Commercial District was added to the National Register of Historic Places in 1979, thus protecting Fountain Square’s historic ambiance. Design guidelines geared towards preservation of the original turn-of-the-century style architecture were adopted in 1996. The city’s 2030 Comprehensive Plan calls for the continuation of a “Heritage Walk” from Fountain Square to the Barren River. In 2010, a local grant program was initiated that would place a series of plaques in the vicinity of Fountain Square commemorating Bowling Green’s history. The nine other APA 2010 Great Public Spaces are: Bryant Park in New York City, NY; Charles W. Ireland Sculpture Garden in Birmingham, AL; Plaza Real in Boca Raton, FL; Emerald Necklace in Boston, MA; Ferry Building in San Francisco, CA; Campus Martius Park in Detroit, MI; Percival Landing Boardwalk and Park in Olympia, WA; Rittenhouse Square in Philadelphia, PA; and Main Plaza in San Antonio, TX. Information provided by the American Planning Association.